What causes soft tissue rheumatism? Can certain kinds of food cause arthritis? Can lack of exercise cause arthritis? Rheumatology, a subspecialty of internal medicine, is devoted to the diagnosis and therapy of rheumatic diseases. The term originates from the Greek rheuma, meaning "that which flows as a river or stream" and the suffix -ology, meaning "the study of". 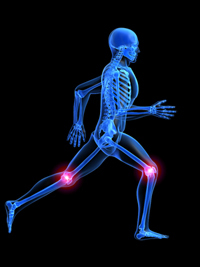 Rheumatologists mainly deal with problems involving the joints and the allied conditions of connective tissue. Arthritis (from Greek arthro -, joint + -itis, inflammation; plural: arthritides) is a group of conditions wherein there is damage caused to the joints of the body leading to pain, stiffness, and swelling of these joints. Some kinds of arthritis do not only affect the joints but other organs too, like the heart, kidney, eyes, and skin. There are many forms of arthritis, each of which has a different cause. Some examples are osteoarthritis, rheumatoid arthritis, ankylosing spondylitis, and infectious arthritis. Rheumatism or Rheumatic disorder is a non-specific term for medical problems affecting the joints, back, and extremities. The term "rheumatism" is still used in colloquial speech and historical contexts, but is no longer used to mean any one particular disease. The traditional term covers such a range of different problems that it is no longer appropriate to ascribe symptoms to just "rheumatism." Soft tissue rheumatism, as the term is used today, refers to diseases of the structures around the joint, namely, tendons, tendon sheaths, epicondyles, ligaments, and muscles. Arthritis and soft tissue rheumatism between them cover at least 200 different conditions that are handled by rheumatologists. 4. What causes soft tissue rheumatism? There are many causes of soft tissue rheumatism but mainly these are due to trauma or strain from repetitive movements or from overstretch of structures around the joints. Many activities of daily living can unduly strain our tendons, ligaments, and muscles and cause pain at these structures. Many kinds of soft tissue rheumatism are painful and disabling but do not cause joint damage like arthritis. Some forms of soft tissue rheumatism can however coexist with arthritis. Tenosynovitis, or swelling of tendon sheaths, can occur quite frequently among those with rheumatoid arthritis. There are as many causes as kinds of arthritis. Inherited or acquired gene defects, infective agents, abnormal antibodies, drugs, light, environmental toxins, lifestyle factors like smoking, alcohol intake, and diet, as well as occupation, can cause or trigger arthritis in a predisposed individual. 6. Can certain kinds of food cause arthritis? Only gouty arthritis, a disease characterized by increased total uric acid in the body, can be precipitated by intake of high purine food or drinks. Examples of food/drink high in purines that get converted to uric acid in the body are sardines, anchovies, dilis, internal organs, mussels (tahong), and alcoholic drinks, expecially beer. Overeating can cause obesity and excess load on the weight bearing joints (knees and hips) increasing the chance of osteoarthritis. Certain food allergies can manifest as arthritis. In this case, the arthritis is only a manifestation of the allergy and will resolve once the allergic reaction subsides. Food does not affect the causation and exacerbation of attacks of other kinds of arthritides. 7. Can lack of exercise cause arthritis? 8. When should you see a rheumatologist?